Posted by Las Vegas Homes By Leslie - on Thursday, February 7th, 2019 at 2:58pm. If you’ve always wanted to live the Downtown Summerlin lifestyle but did not want the responsibilities that come with homeownership, you will love Tanager. The new 267-unit Howard Hughes Corp. rental project across from the Downtown Summerlin mall is named as a tribute to the Curtiss Model 54 Tanager airplane built in 1929. Under construction now, the complex is expected to begin leasing in early 2019. Tanager continues the Aviation Row theme that was begun in 2015 with the first area’s first luxury apartment complex, Constellation, which was named in honor of a plane built by Lockheed Corporation. Constellation, a 124-unit gated luxury rental residence complex, creates an oasis of vibrant modern one- and two-bedroom homes from 950 up to 1,900 square feet. In addition to the sleek, fresh exteriors, the multi-level Tanager complex boasts modern, chic interiors with an assortment of options, including Dwelo Smart Technology apartments. With all the features and amenities one could want Tanager has the carefree active spirit that young professionals, empty nesters, and anyone in between could want. A variety of layouts and sizes to choose from mean you can customize your Tanager residence to suit your unique style. With units ranging from 660-1,300 square feet, you can create the perfect one- or two-bedroom home. Looking for a colorful ultra-modern vibe, retro chic, or a soothing serene retreat? No problem. The elements can be customized to suit you and your lifestyle. Like Constellation, Tanager will provide residents with exclusive amenities like an onsite fitness center, game room, and resort-style pool with cabanas. There’s even a dog park planned for the canine members of the family. With an on-call masseuse and aesthetician, your luxury lifestyle is complete. For the sports enthusiast Tanager, and Constellation, is a dream come true. The complex is located south of City National Arena, where the Golden Knights practice, and Las Vegas Ballpark, which opens in April 2019 as the home of the Las Vegas Aviators. Not to be left out, the outdoor enthusiast can enjoy Summerlin's 150 miles of completed trails, 10 golf courses, and proximity to green spaces and national parks. Summerlin, the largest Las Vegas master-planned community, includes access to premiere public and private schools, opportunities for cultural enrichment, medical facilities, and houses of worship. More than 250 parks provide beauty and green space for residents wanting to take a walk or enjoy an afternoon picnic. Located in the very heart of Downtown Summerlin, Tanager gives residents easy access to more than 125 shopping venues, entertainment options, and fine dining establishments. With its unparalleled walkability and full immersion in the modern urban lifestyle of Downtown Summerlin, Tanager is expected to lease quickly. If you would prefer to buy rather than lease or want something different from an apartment, consider purchasing a condo or a house in Summerlin. Your fulltime residence will allow you to take advantage of the carefree luxury lifestyle that Summerlin residents enjoy every day. Intrigued? The best way to see if a Tanager and Downtown Summerlin are a good fit, is to see them in person. Consider scheduling a tour of the complex and units. 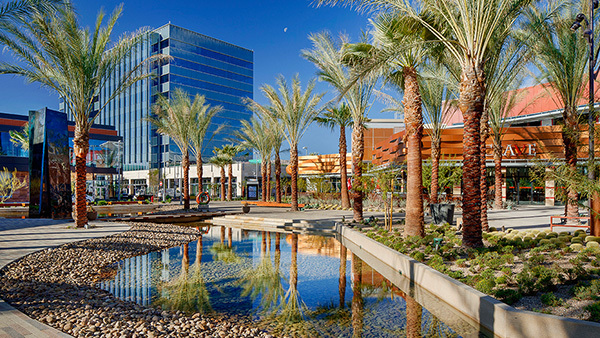 Maybe take a stroll through Downtown Summerlin or enjoy shopping and a lunch with friends at one of the eateries. Make it a date night with dinner and a show to experience the vibrant nightlife. Or, check out the local parks and green spaces. No matter what you choose, you are sure to be captivated and enchanted by the lively spirit of Tanager and Downtown Summerlin. Leslie would be happy to provide more information about owning a home or condo in Summerlin. New construction is booming here, there are some wonderful choices for brand new homes as well.